...will take place on Sunday, June 12 at 5:00 pm at the Germantown Meeting House. The Grad Concert is a highlight of the KSB season and is as touching as the Jacketing ceremony. This is the concert at which we say good bye to our graduating seniors, and it is a moving celebration of the time they have spent making music with KSB. Baritones, Grad Candidates, and Grads are called for this concert. Parents are encouraged to attend and bring friends and family. - This is a ticketed event. Tickets are $10 for adults and $5 for children 12 and under. They can be purchased at the door. - There is plenty of parking on the Germantown Friends campus and on the surrounding streets. - The meetinghouse is NOT air conditioned, so dress for warm weather. Temperatures are forecasted to be in the mid-80's on Sunday. 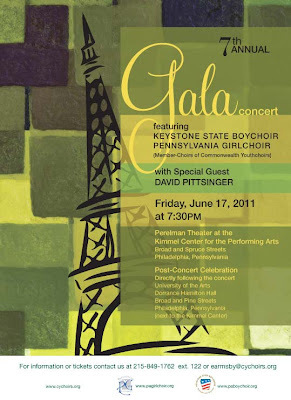 We hope to see you at our Gala Concert on June 17. It will be a great way to kick off the summer. Please feel free to forward this to any friends, family, or business associates that you think might enjoy the concert. For for information, see the full press release. Click here for the pdf file with the announcement shown above..
At 7:30p on Thurs, June 9 @ 1st Presby Church in Germantown, the Drakensberg Boys' Choir will cap off the day's workshop in a "musical sharing" with KSB. The Drakensberg Boys' Choir is on US Tour, giving 10 concerts at venues across the country. To catch up on their tour to date, read their concert tour blog on the choir's home page. We hope that you can join us for what should prove to be a wonderful musical experience.